Looking for Assistant Professor jobs in Arts & Science Colleges 2018 in Tamilnadu? or Searching for Faculty Plus Teachers Tamil Nadu 2018 or Faculty ON Tamil Nadu? 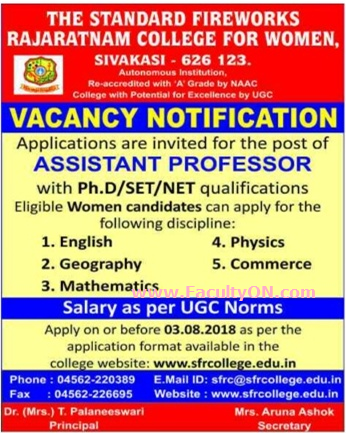 A college based in Sivakasi named Standard Fireworks Rajaratham College for Women, Sivakasi has advertised in the DINAMALAR newspaper for recruitment of Assistant Professor jobs vacancy. Interested and eligible job aspirants are requested to apply on or before 03rd August 2018. Check out further more details below. About College: “The Standard Fireworks Rajaratnam College For Women” was established in 1968, in memory of the late philanthropist Thiru N.R.K.Rajaratnam, whose pioneering spirit in business and industry has earned for himself an indelible niche in the annals of Sivakasi. Thiru Rajaratnam’s matchless genius and tireless energy gave rise to the “The Standard Group of Industries”. The late Thiru K.A.A.Sankaralingam Nadar and Thiru K.A.A.Arunachalam Nadar and Thiru C. Chelladurai Nadar were the founder architects and stalwarts of this edifice of learning. They chalked out a programme for the dawn of higher education and intellectual upliftment of rural women in and around Sivakasi by generating the “ The Standard Fireworks Educational Charities Trust”. PG with NET / SET / Ph.D. Only women candidates need to apply. How to Apply: Interested and eligible candidates are requested to send their application in prescribed format downloaded from college website along with copies of certificates, testimonials and recent Passport Size photograph to the postal address mentioned below.